A Ministry of Natural Resources water bomber attacks a brush fire in the Stanley area on Monday evening. 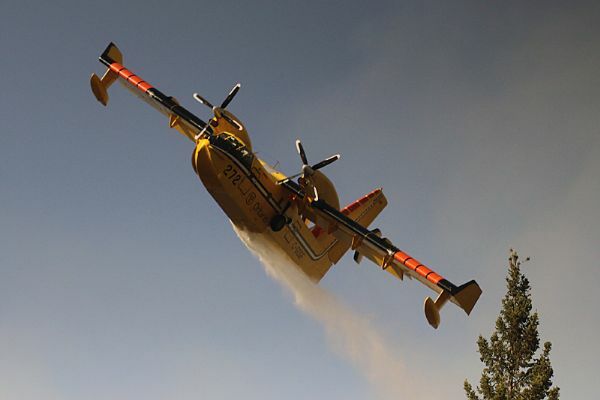 THUNDER BAY – A major brush fire near Stanley that was threatening an area cemetery and a number of properties has been knocked down. Nearly 40 firefighters from Oliver Paipoonge, Conmee and the Ministry of Natural Resources, along with two water bombers, spent more than two hours Monday evening working to control the blaze that broke out in the wooded area off Highway 11/17 near Pebblestone Road. Oliver Paipoonge fire chief Mike Horan said the blaze came within 200 feet of the Stanley Hill Cemetery and within 150 metres of some of the nearby homes. “We concentrated on the values in front of the fire, which were the cemetery and the four or five houses off Pebblestone,” Horan said shortly after 8 p.m., when he declared the fire under control.